Meyer Tool Qualifies Welders for Pressure Equipment Directive Work - Meyer Tool & Mfg. 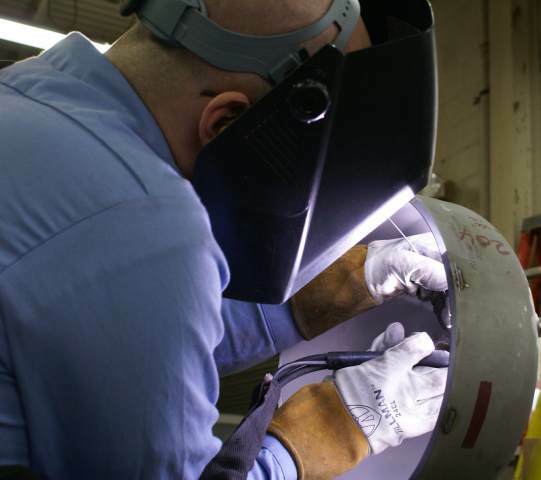 Meyer Tool welder works on pressure vessel head. This past October, five members of the Meyer Tool & Mfg., Inc. weld department spent an intensive two days welding test coupons while under the observation of Mr. Todd Ward of the Hartford Steam Boiler Inspection and Insurance Company (HSBCT). These endeavors were part of a successful effort to certify our welders to build pressure vessels and piping that would meet the European Union’s Pressure Equipment Directive (PED or Directive 97/23/EC). The welders, who were all previously qualified per Section IX of the ASME Boiler & Pressure Vessel Code, were required to meet additional criteria per EN ISO15614 and EN ISO 287-1. These additional criteria included direct observation of fit up and welding of the test coupons by a representative of the Notified Body, analogous to the Authorized Inspector in ASME parlance. Mr. Ward is actually an AI for ASME work as well as being trained in PED requirements. After visual observation and acceptance of the samples, as well as recording of essential details of the welding process, new Weld Procedure Specifications, Procedure Qualification Records and Welder Qualification Records were developed by the Notified Body representative and Meyer Tool’s in-house pressure vessel expert, Project Engineer Tony Vouris. All test coupons were sent to an independent A2LA Certified Laboratory for a battery of tests required by EN ISO15614. With all tests having been successfully passed, Mr. Ward completed all the paperwork and has sent it on to HSB Global Standards offices in Germany. All work performed by for the PED must ultimately be approved by a European addressed Notified Body. Congratulations to the five welders: Bob Aspen, Bill Berger, Cindy Dydra, Ed Kasper, and Shawn Klippstein! Their hard work has expanded Meyer Tool’s ability to offer PED welding services to our customers. Earning these qualifications Reduces Project Risk on pressure equipment requiring PED certification and underscores our commitment to providing our customers with the lowest total cost of ownership. The weld procedures and welders are qualified to liquid helium temperature in stainless steel and aluminum from greater than or equal to 0.25" diameter to unlimited and .035" thick to 0.474" thick. If you have any questions or desire information on the exact nature of the qualification and how this might address your needs, please feel free to contact us.